These are open all year round with the headwaters being open in Summer only from the 1st of December to the 31st of May. Lake Taupo tributaries and stream mouths, offer excellent fishing during the winter months as trout enter all the rivers and make their way upstream from the lake to spawn. This gives the river angler may fishing option from the six major rivers that flow into Lake Taupo on the eastern side, with the famous Tongariro being the largest of them all which flows through the town of Turangi to the smaller streams with four of them being within fifteen minutes drove of Turangi. The trout at this time of the year are in superb condition after feeding up on a great food source in Lake Taupo over the summer, they are silver and strong and gives the anger a great fight. These rivers open from 1 October to 30 April with many others open until 30 June. This is where we stalk and sight fish to large resident brown and rainbow trout whose fighting strength is like none other and will test the skill of the worlds best anglers. The large 290km Whanganui River runs from rugged bush country west of Lake Otamangakau towards Taumarunui, through the Whanganui National Park before reaching the mouth at Whanganui on the West Coast. 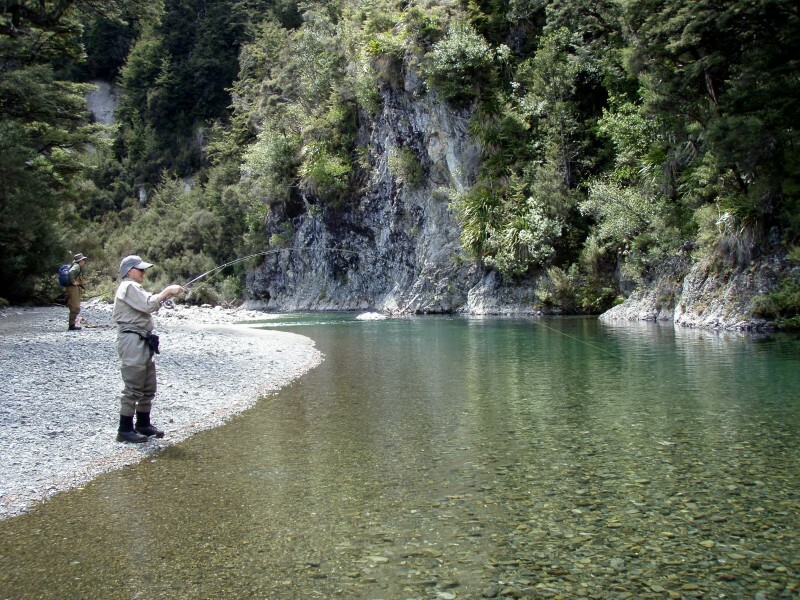 The Whanganui and it’s many tributaries offer some of the best trout fishing in the North Island, from drive through farm access to hiking into the head waters through beautiful native bush and birds, including the endangered Blue Ducks (Whio). The central North Island also has many other great rvier and stream system, most within an hours drive from Turangi. For the angler that wants a real adventure to the most remote rivers, a helicopter flight is the way to go. These rivers hold good numbers trophy rainbows & brown trout. Fishing the backcountry of this region is an unbeatable experience. Packages can be tailored to suit you from flying by helicopter to driving and hiking up a river or the easier option of camping next to the river on an exclusive farm setting. Camps are well provisioned and comfortable, with down sleeping bag, inflatable bed rolls or air beds, great tents, BBQ and chairs and all other camp necessities to ensure a comfortable stay.